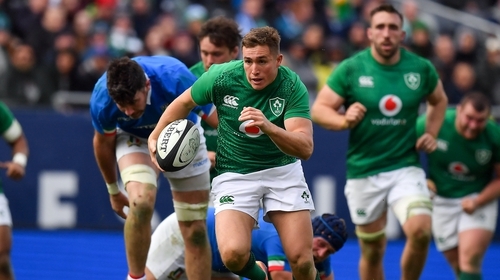 Jordan Larmour's speedy attacking abilities have put him on a path to fulfilling his "scary" potential, according to Ireland team-mate Luke McGrath. Leinster wing Larmour raced in a blistering hat-trick on his first Test start as Ireland thumped Italy 54-7 in Chicago on Saturday. The 21-year-old has been shortlisted for World Rugby's Breakthrough Player of the Year award, having starred as Leinster scooped the Guinness Pro14 and Champions Cup double. Rob Kearney's continued shoulder injury issues could see Larmour continue at full-back in Saturday's Test clash with Argentina in Dublin, with scrum-half McGrath backing his provincial team-mate to thrive if called upon again. "He's a freak; I get the opportunity to see him do that the whole time in training," said McGrath. "Some of his tries, the one at the end (against Italy) was incredible. He set me up for one as well; he can do it all. "He's a player... it's scary to think how young he is and the potential he could fulfil. He will keep the head down and keep going but he is definitely one to watch. "He has such good feet, he can attack from everywhere. He can also kick. McGrath should be primed to start at scrum-half against the Pumas this weekend, for what would prove to be just his eighth cap. The 25-year-old has seen the door open due to Conor Murray's continuing recovery from neck troubles, and he impressed against Italy in the United States. McGrath firmly believes Larmour has only scratched the surface on his rich talents, hailing the young Leinster gun for adding an extra dimension to any attack with his relentless support play. "He's getting more confidence with more game time; he's like a constant battery, he's got so much energy, he can't stop moving," said McGrath. "You look at him on the pitch and he is like that, he always wants to get the ball, he's always talking, to the scrum-half and the 10. "He wants to get the ball in his hands all the time. That's incredibly exciting and it's great to play with because it gives you options. Two-sided attack; he's getting better and better and it's going to be exciting to see where he goes."